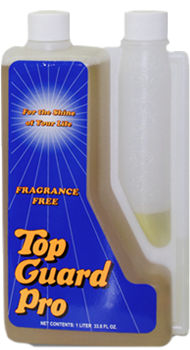 TOP GUARD BASE SHIELD is a next generation floor finish with best ever "off-the-mop" gloss. This ultra-high solids formula provides exceptional film clarity, repels soil and scratches, and extends the time between stripping cycles from 18 to 36 months. A wet-look gloss floor finish featuring Top Guard's XL7 polymer technology. XL7 produces outstanding long-term clarity, excellent abrasion resistance and extended durability. Durable long lasting finish that can last in excess of 3 years before stripping. 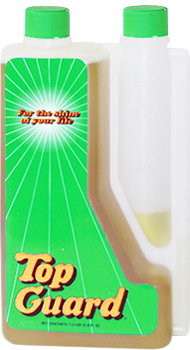 Extremely high solids, fast drying formula requires 1/3 less costs. Packaged in Eco-Preferred Recycled Pails. The Top Guard environmental responsibility "Green with Less" program is centered on the introduction of less product to the environment. Base Shield's high solids content allows you to use 33% less product without giving up any durability or gloss. 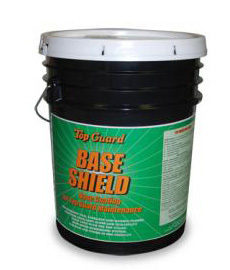 In fact, using Top Guard with Base Shield can extend the life of Base Shield in excess of 3 years before stripping. That means less floor finish, less stripping, and less environmental impact. Green with Less!